Scaling up natural fertility awareness methods increases access to family planning. 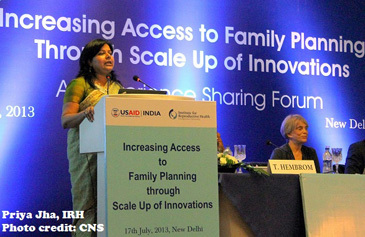 The Experience Sharing Forum on "Increasing Access to Family Planning through Scale-up of Innovations" was organized in New Delhi on 17th July by Institute for Reproductive Health (IRH) and United States Agency for International Aid (USAID) where a large number of participants from many states of India actively took part. Jharkhand government has successfully integrated natural and modern fertility awareness methods such as SDM and Lactational Amenorrhea Method (LAM) of family planning into various delivery mechanisms. These methods were also offered via civil society organizations and social marketing agencies in Uttar Pradesh. Additionally, prominent private-sector channels such as Mobile Health and online presence were also explored. “IRH’s work in Jharkhand has given more family planning choices to the people and resulted in community empowerment. Jharkhand government’s partnership with IRH has successfully scaled up SDM and LAM from 3 blocks in Ranchi to 12 districts over the past years. According to Government of Jharkhand’s Family Planning Statistics 2008-2013 data: 102,762 people use SDM and 243,962 people use LAM in our state” said Dr Manish Ranjan, Mission Director, National Rural Health Mission (NRHM), Jharkhand state in a video address. Jharkhand government has also integrated SDM and LAM to the level where data is regularly collected from community health centres to inform the state statistics. Added Dr Ranjan: “Family planning does not only mean restricting and spacing childbirth rather it is an integrated approach for welfare of women, children and family. IRH has helped women and men in Jharkhand villages in becoming aware of healthy evidence-based family planning practices and expanded choices on how they can plan their family well. Choice is broader now and has increased dialogue between husband and wife. SDM and LAM are not just two words – but are strong platforms for communication between husbands and wives, community health workers and community members.” SDM and LAM have been programmatically integrated very well in Jharkhand. This means that LAM and SDM are included in all family planning related IEC, CycleBeads are available in stocks and are part of logistics supply system of the state government just like condoms, IUDs, among other government endorsed methods. CycleBeads under the brand name of ‘Mala Chakra’ are being provided free of cost as part of the government programme in Jharkhand but social marketing efforts also exist in the state promoting CycleBeads at a subsidized cost under the brand name ‘Suraksha Mala’. But if the same product is distributed free, will people pay for it? In rural Deogarh, Jharkhand, PSI was the social marketing partner of IRH and sold 4,000 ‘Suraksha Mala’ in about 1.5 years despite ‘Mala Chakra’ being available for free in public sector through government supplies, said Priya Jha, Country Representative of IRH in India. Dr T Hembrom, Deputy Director, Ministry of Health and Family Welfare, Jharkhand, and Deputy Director, Jharkhand Rural Health Mission, presented data on uptake of different family planning options in the state. More than 50% people in the state were not using any family planning method. Family planning method with highest uptake was female sterilization: 29%; whereas male sterilization stands decimated at 0.5%. If we look at data from Deogarh in Jharkhand, there were 804 female sterilizations done compared to 6 male sterilizations. Priya Jha of IRH said that in Simaria community health centre of district Chhatra in Jharkhand, 38 female sterilizations took place (compared to zero male sterilization). Condom use remains abysmally low in the state at 3.3%. Other government endorsed methods such as periodic abstinence was practiced by 4.7%, withdrawal by 2.5%, emergency contraceptive pills (ECPs) by 0.1%, oral contraceptive pills (OCPs) by 0.1%, Intra-Uterine Devices (IUDs) by 0.8%, among others. Current use of LAM was 2.4% and SDM was 3.5%. “Large number of service providers and almost all the medical officers, ASHAs, ANMs, among others, have been trained in fertility based methods” said Dr Hembrom. A range of information and education campaign (IEC) approaches also helped increase awareness and uptake of SDM and LAM such as: wall paintings, wall writings, hoardings, posters, pamphlets, community radio, street theatres, among others. Priya Jha of IRH emphasized on quality assurance when scaling up evidence-based interventions. IRH had put together Knowledge Improvement Tools (KITs) for LAM, SDM, and other spacing methods too. Proper data collection, input from service providers such as ANMs, medical officers (MOs), ‘Sahiyaas’ (community health workers) among others is so important to help sustain and improve programme outcomes. Training helps and so does having conversation around new evidence-based family planning methods. IRH collected baseline and endline data on a range of indicators, one of them was the advice given during post-natal visits. Advice given on exclusive breastfeeding went up from 47% to 65%, on family planning went up from 11% to 57% and on LAM went up from 1% to 36%. Another interesting lesson was that ‘Sahiyaas’ reported 51% of the times they had counseled men and women together and 48% they had counseled women alone. Hindustan Latex Family Planning Promotion Trust (HLFPPT) has been using social marketing approaches to promote SDM in Kanpur, Uttar Pradesh (UP). “Free contraceptives are often not valued” said Sharad Agarwal of HLFPPT. “Free supplies report higher waste of products at both consumer level and disbursement line with little accountability. Social marketing of contraceptive products keeps the price low enough to be affordable to low income consumers but high enough to attach a value to the product” said Agarwal. In Kanpur, SDM intervention was integrated with other initiatives such as Merry Gold Health Network and Sankalp poject, and initiated in 10 slums and expanded to 40 slums and 4 rural blocks during November 2010 - June 2013. CycleBeads were branded as “Ritu Mala” and sold for Rs 35 by social marketing approaches in Kanpur. 6,800 ‘Ritu Mala’ pieces were sold. SDM initiative also gave an opportunity to counsel on menstrual hygiene, pregnancy, and other related issues, said Agarwal. CycleBeads are an entry point for other family planning and health products, he added. Dr Dinesh Agarwal, a noted public health expert who was earlier with UNFPA, said that programmes are vulnerable unless driven, owned and firmly embedded in communities. There is neither a panacea for weak heath systems nor a cheap option to provide access to healthcare for underserved population. Such programmes remain good investments, since alternative is “no care at all”, said Dr Agarwal. Citizen News Service - CNS believes that all women and girls have a right to have the information about fertility periods, and male partners need to be responsible in contexts where possible about fertility periods too. Not promoting (and scaling up) evidence-based modern methods with proven efficacy seriously limits options for most in need women and girls, and their partners. Hope successful example of SDM and LAM integration in Jharkhand state, other areas in India and other countries will inform government programmes to improve outcomes.